One of the most common questions I get is, “where does the money go?” Molly did a great job breaking down expenses for the 2016 project to El Salvador, and I am following up with a summary of expenses in Haiti. A project’s expenses vary. Sometimes, a local partner will provide accommodations, transportation, or food for us. In Haiti, we incurred those costs. What’s exciting to see is how most of our expenses were paid directly to Haitian individuals and organizations. We don’t calculate the economic impact of our projects, but we do prioritize buying locally whenever possible. (1,644), the per person cost is $5.39. In other words, we presented folks with a professional performance for the round trip price of a ride on the NYC Subway! To our Haitian partners. 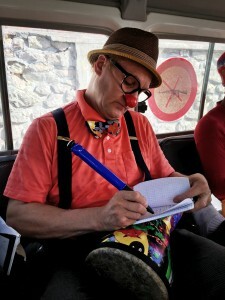 As a rule, Clowns Without Borders artists volunteer their time and expertise. This volunteerism is what makes the work possible. If we paid our volunteer artists a conservative rate of $300 a day, their contribution would total $176,700 (more than our organizational budget). However, it would be unfair, and unsustainable, to expect our local partners to donate their time. In Haiti, we paid the local artists a daily stipend. Comedus invested part of their stipend in buying their own motorcycle so that they can travel to gigs. To our local Driver and local tap-taps. Mr. Senatus, our local driver, is the unsung hero of our project. He traveled with us to each show and was an essential part of the team. Beyond providing security and transport, he looked out for us, cheered us on, and joked with us. He met every clown challenge with a smile and accommodated our hula-hoops, instruments, and endless singing. At times, our group was as large as 30, so we hired a local tap-tap to travel with us. Tap-Taps are beautifully painted, converted vans or trucks that operate as public transport throughout the country. To lodging. We started the trip at Haiti Communitere, an organization with the mission to “offer a space where groups come together to build a larger community of collaboration, knowledge exchange, sharing and respect in order to affect relevant and sustainable development.” One way they reach that mission is by offering accommodations to other grassroots organizations. Haiti Communitere provided us with space to stay and rehearse, and also a network of people and support. In Grand Goave, we stayed in what will be a beautiful hotel…once construction is complete! The owner’s graciously accommodated our clown troupe, and let us use the lobby as a rehearsal space, dance floor, and our dining room! To our local cook. 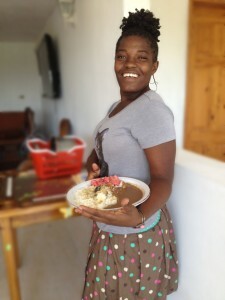 Incredible Asmithe, not only participated in our workshop, but also prepared all of our meals when we were in Grand Goave. Asmithe prepared 3 meals a day, an endeavor that started by walking to a well, carrying gallons of water up a steep hill to her house, and cooking over open flames without electricity. Then, she and her brother would carry the food back down the steep hill, balance themselves, and pots and pans, on the back of a motorcycle, and bring it to us. By giving money directly to Asmithe, she was able to shop at her local market. Our food budget stretched to include over 1,000 meals.